This winter will see the final installment of The Hobbit film series released in theaters with The Hobbit: The Battle of Five Armies. But with Comic-Con hitting this week, Peter Jackson is eager to start sharing some images from the highly-anticipated completion to his latest trilogy. That includes the poster above, which shows Smaug spitting fire and bearing down on the village of Lee Evans' Bard the Bowman. Bard stands in the foreground with his back to us. (Classic). And let's get real, if we were him, we'd bolt. That's one big, scary dragon. Posted on Peter Jackson's personal Facebook, the above poster teases The Hobbit: The Battle of Five Armies's presence at San Diego Comic-Con. Warner Bros. has secured the hallowed Hall H for whatever it is Peter Jackson and company have in store. Yet, he's warned fans on his Facebook page that they shouldn't expect a full trailer, saying "Of course, many of you asked about the Hobbit Trailer. So, yes - there will be a Hobbit Trailer. But like the previous two years, it’s not going to be released until around Oct. The complex VFX work required to produce the battle shots we’re all wanting to see are simply not far enough along yet." Still, that doesn't mean there won't be a teaser playing Saturday morning at Comic-Con. In fact, Jackson all but promises that, writing, "I finished work on a Teaser Trailer and that has just been delivered to Warner Bros. So no doubt this Teaser Trailer will be making its way into the world sometime soon…"
Meanwhile, The One Ring has been given a still from The Hobbit: The Battle of Five Armies. Instead of focusing on the hairy-footed hero the trilogy is named for, this picture reveals a harried Gandolf (Ian McKellen) and Bard the Bowman. Note Gandolf has his sword, Glamdring, in hand, and there are soldiers out of focus but armored and armed just behind the pair. It seems this will be part of the sequence where the people of Esagorth prepare for the coming of the terrible dragon Smaug (voiced again by Benedict Cumberbactch). Perhaps those in Hall H will get a peak at the scaly tyrant in action this weekend. 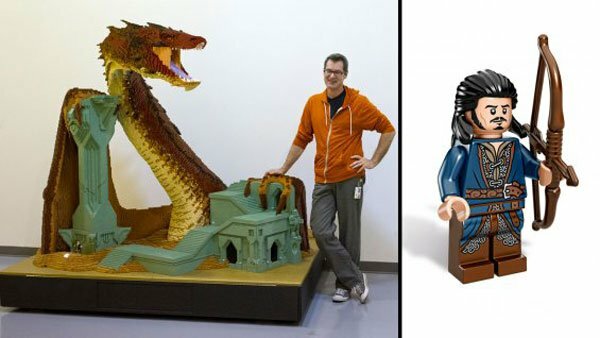 One thing we know for certain will be on hand for Hobbit fans is this large-scale model of Smaug, presented by and made of LEGO Systems. The Warner Bros. booth with also have a chance to win that handsome Bard mini-fig pictured below. 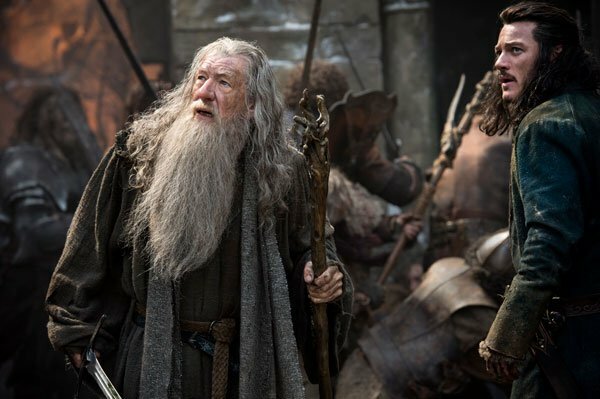 The Hobbit: The Battle of Five Armies will open on December 17th.